Approaching my 35th year collecting colecovision I decided it's about time I shared my collection for my favorite console! Hopefully I can add more specific item pics in the future too. Back last thanksgiving I built custom shelves to display my nearly complete pre Nintendo USA based console game collection. 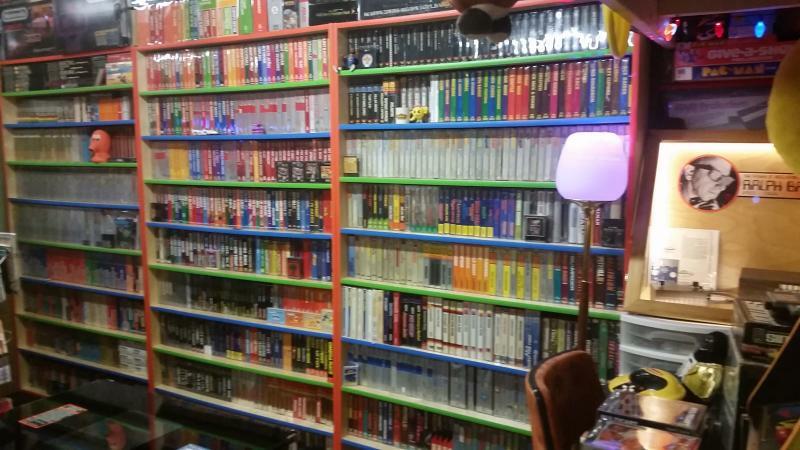 It holds over 1200 boxed games. 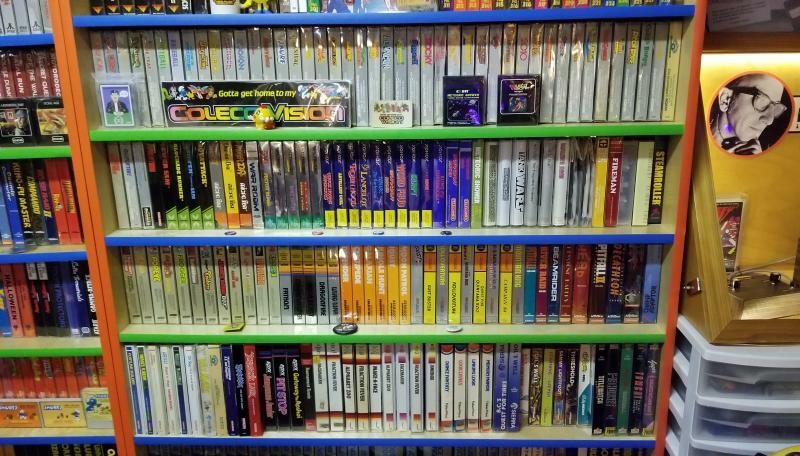 This is the colecovision section holding my complete cib collection of the original 140 released games, plus a few variants. And this last week I built some more generic shelves to hold my coleco hardware. I call it the wall of coleco. 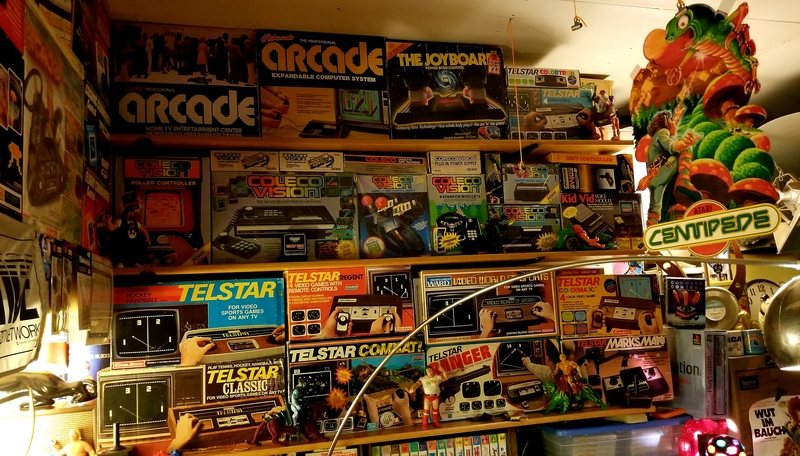 just about everything fit on except my telstar arcade that was slightly too tall which is now just to the left of the main wall and a couple astrocades took it's planned spot. Also my Dina 2in1 is not up there yet. Maybe something else too.....can't think what else there is?? I know I need 3 more telstar systems to have all 14 of those. The cib colecovision system is the one I got for christmas in the early 80s! Love it! Very impressed but also very interested in what appears to be a showcase with a Ralph Baer tribute just to the right of your Coleco shelves. How bout a pic of some Odyssey love? My son helped me make the big shelving unit over thanksgiving break. I used arcade t molding on it that blends in great to the game room. I know you love atari 2600, here is a pic that shows most of the full unit with most of my 2600 collection in the middle unit. Edited by stupus, Thu May 24, 2018 5:59 PM. When you get a chance take a better picture of the 2600 stuff it's a little blury. I have been working on my game room vertical space is nice. Thanks for the pic of the brown box. So amazingly cool! Thanks for sharing. I love unique items like this. I will do that. That was my old phone, new phone takes such better pictures. Yeah vertical space is great, I have 9ft ceilings in here and it makes the room seem much bigger and it can be utilized for display well. They actually can hold about 450 games each if you put games on the top too. Each of the 3 units is 80 inches tall and 4 feet wide. 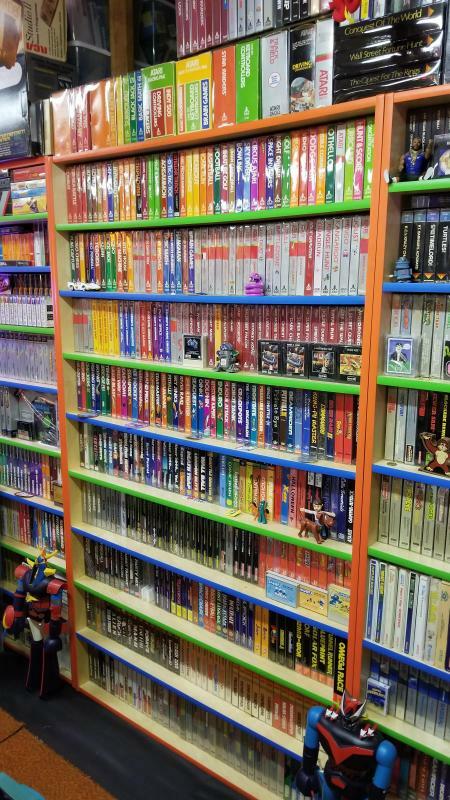 They are 9 shelves each, 10 with the top and each shelf holds about 45 games. Is that Meteoric Shower cart original or a repro, BTW? I've been playing a ton of that game on my DINA lately. That is actually a real bit Corp meteoric shower cart. All my other bit titles are the telegames releases. It was a great game to have built into the dina! Nice! I noticed the Telegames carts in there, very cool. I like that they just ripped the "Wars" in Tank Wars from the Star Wars logo. I love the Dina. Great little system IMO (assuming the video/audio/power/heating issues have been ironed out). I probably play Meteoric Shower as much as my favorite Coleco and SG-1000 carts. Edited by BassGuitari, Fri May 25, 2018 10:53 AM. Yeah the tank wars star wars rip off font is great. Edited by stupus, Fri May 25, 2018 1:32 PM. It's too bad Telegames didn't/couldn't source any SG-1000 software back in the day. That entire format could have effectively been Telegames-exclusive and would have doubled the appeal of the DINA/Personal Arcade*. It's also surprising that Bit Corp. doesn't seem to have created any games (which Telegames could have later licensed) for the Sega like they did for the Coleco, since IIRC the country where the SG-1000 was most popular--outside of Japan--was Bit Corp.'s native Taiwan. Ahh.. A tasteful themed collection. These kinds of collections are ok.
Wow! Do you have a boxed copy of Swordquest Waterworld? How much do those reproduction boxes cost to have made? This seems like it was meant for my atari collection thread? But yes I do have a cib waterworld I have ever atari brand release for the 2600 cib except for quadrun which I have but the box is a repro. Repro boxes vary in cost, most were made in small batches by various people in the past and are not available to buy anymore. Marc Oberhauser has a website where he sells some he does. I think they are about $15-20 a piece plus shipping. Here is a better picture of just the center unit which has over 95% of my 2600 original ntsc releases on it. A few others are displayed individually around the game room.